The Nordenskiold #16 Trail and Badger House ruins are located on the Wetherill Mesa in Mesa Verde National Park. To make the most of seeing the sites on Wetherill Mesa this post begins by hiking to the Nordenskiold (pronounced Nordensholt or Nu:rdenhoeld) #16 overlook then backtracks a little bit and proceeds to the Badger House ruins where we then catch the free tram which takes us to the Kodak House and Long House Overlooks before whisking us back to the Wetherill Mesa trailhead where we began. This approach makes it very easy to also take the Long House tour and do the hike to the Step House all in one day. 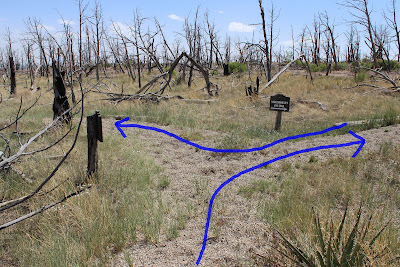 The Nordenskiold #16 and Badger House trails begin at the same point behind the Wetherill Mesa Kiosk. The trailhead is in back of the park rangers information area. The area is only open until sunset so if you get there too late in the day there may be a Trail Closed sign sitting in the middle of the path. This area of Mesa Verde was burned by a fire in the year 2000 so there aren't any trees left to provide shade. The trail has a thick layer of pea gravel covering it almost the entire way which makes it a little harder to hike than solid ground. The trail is fairly flat so the lack of hills probably offsets the loose gravel. The trail crosses the tram road after a short distance. For safety reasons hikers aren't allowed to walk on the tram road. They still have to watch out for wild horses though. There are around 150 wild horses in Mesa Verde and a few of them seemed to like the Wetherill Mesa area. About 3 tenths of a mile from the parking area the trail splits. The right fork leads to the Nordenskiold #16 overlook and the left leads to the Badger House. It is about 6 tenths of a mile to the Nordenskiold site from the last fork. The trail crosses the road again at a tram stop. There is always the option to ride the tram to this point or catch the tram after returning to here but it's really not that far and this is a hike. After crossing the road the trail wraps around the upper portion of the canyon to the overlook. The Nordenskiold #16 cliff dwellings are interesting because the cliff has sort of a double alcove that the ancient architects took advantage of to make two levels of structures. The ruins are far enough away that a pair of binoculars or a telephoto lens are needed to see them well. After retracing the trail to the Badger House fork and following it from there it comes out at the ruins that are on the mesa top. There is another set of restrooms with flush toilets and a drinking fountain at this location as well as a sheltered picnic table. Also, the trail is all paved from this point on. Each of the sets of ruins in this area are protected by a metal building. The first building houses some Basketmaker pithouse ruins. The next site is a pueblo village which is followed by the Badger House and Raven House ruins. One of the nice aspects of these various sites is how they show the progression of the Ancestral Puebloan people over hundreds and thousands of years from the archaic nomadic type lifestyle through the Basketmaker and Pueblo times. A lot of history in one small area. After the Raven House it's time to catch the free tram for the rest of the tour. The tram makes a big loop around the mesa and stops at the Kodak House Overlook. It is another double alcove that again can best be seen with a pair of binoculars or a telephoto lens. The tram stops again at the Long House Overlook before heading back to the parking area. The Wetherill Mesa section of Mesa Verde National Park is only open between Memorial Day and Labor Day. 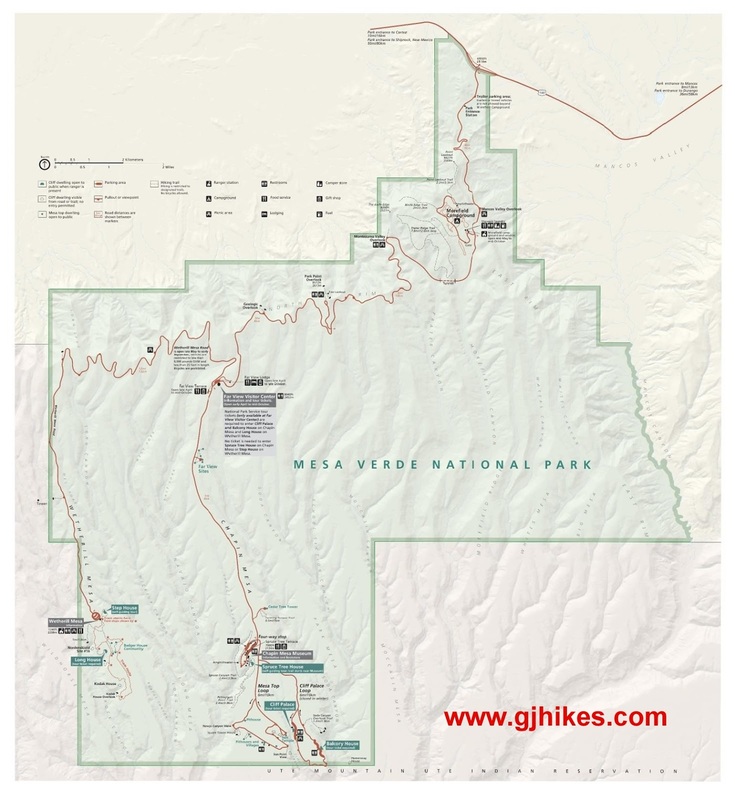 To find out more about operating hours and other useful information to plan your trip check out the Mesa Verde website. Wetherill Mesa is about a 30-45 minute 12 mile drive from the Far View Visitor Center. The road is all paved but it has some steep grades so they limit the traffic to vehicles less than 25 feet in length and 8000 GVW. The crowds are a lot smaller on Wetherill Mesa and the Nordenskiold #16 trail is probably hiked the least. If you would like to see it for yourself then all you have to do is 'Take a hike'.